Kizingo Lodge is located on one of the long and almost deserted beaches on the southern tip of Lamu Island. 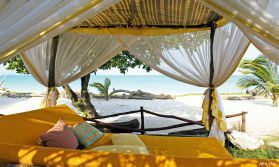 It is a small and comfortable lodge comprising 8 spacious bandas on the sea front and a lounge and dining area serving exotic seafood and Swahili dishes. The bandas are constructed of palm woven matting and local materials and each has an en-suite shower room with spacious shower, eco-flush toilet and solar-heated hot water. The bandas all have a large verandah with a swinging hammock bed. Activities available include swimming, cycling on the mainland, bird and bush walks, visits to Lamu Town and also to the local community. From May to October, deep sea fishing can be arranged, subject to local conditions. From November to April swimming with dolphins, snorkeling, scuba diving and course fishing can be arranged. Kizingo Lodge is offered on a full board basis. Open: Kizingo Lodge is open from 1st July to 30th April each year. From May to October the average daytime temperature is between 28 and 32 degrees C and there can be strong winds. From November to April the average temperature is between 30 and 35 degrees. Location: Kizingo Lodge is on Lamu island. Flights from Nairobi take about 90 minutes and from Mombasa take about 45 minutes. Kizingo is a 30 minute drive from the airport on Lamu. Rooms: There are 8 spacious, high-ceilinged bandas set on the beach, built of local materials including wood and palm leaves. They have comfortable beds with mosquito nets and easy chairs. The en-suite bathrooms have hot (solar-heated) and cold running water, a hand basin and flush toilet. At the front of each banda is a shaded veranda with a Lamu swing bed overlooking the ocean. They are set well apart from each other to give you privacy. Activities Most of these are water-based. You can go swimming, snorkelling and body surfing. Creek and deep-sea fishing are available. You can explore by bike or on foot, stroll along the 12km beach, visit local villages and Lamu town. From November to April you can go on guided snorkelling trips to a small coral island, where you may have the chance to swim with dolphins. Between October and June you may witness green turtles coming ashore to lay their eggs. Facilities: The lodge has a pleasant dining room and bar, the social heart of the lodge where guests mingle and spend time getting to know each other. The owners, Nary Jo and Louis, also spend time here. The lodge can arrange massages, manicures and pedicures. Dining: Breakfast, lunch, afternoon tea and dinner are included in the room rate. Bread is baked each morning in a special clay oven on the premises. Seafood features prominently on the restaurant menu. This is complimented by locally sourced vegetables and salads, and wines from South Africa, Chile and Italy. You can eat with other guests in the dining room or elect to enjoy private meals on your veranda. "Kizingo Lodge a brilliant destination, loved the rural setting with local building materials and use of solar energy."